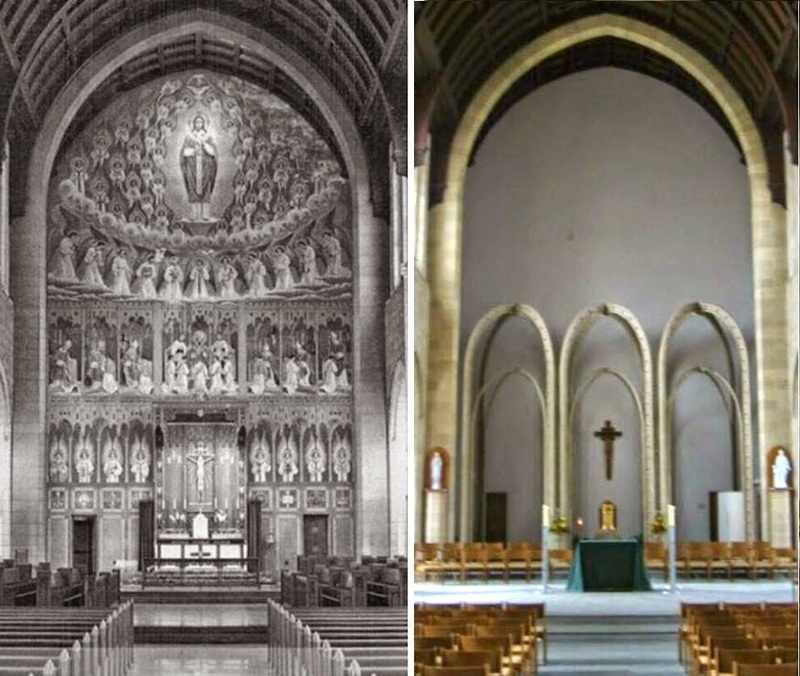 Of course, while the destruction of the Lamers mural was the most obviously devastating loss given its scale, equally lamentable was the loss of the canopied high altar. Now in some instances what was lost can at least find some respite in what had been gained, however in this instance one admittedly struggles to find any gains whatsoever. 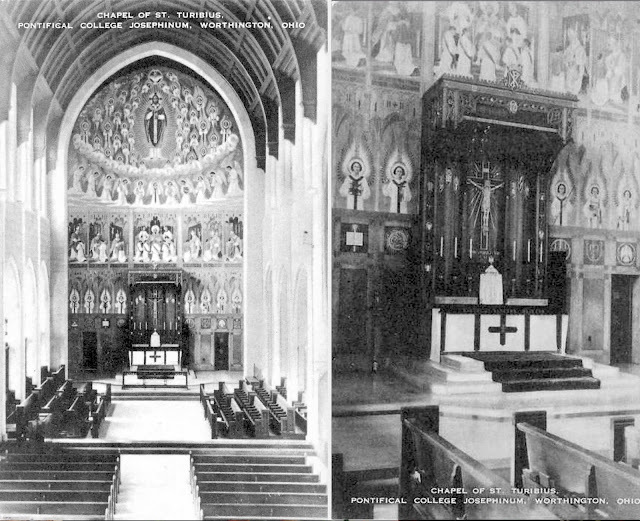 Aside from the rather barren and sterile wall that now faced congregation and clergy alike, the new altar was neither proportionate to the chapel in its size, nor did it have the benefit of a ciborium or even a predella to help distinguish it in anyway. What's more, the gothic-esque bars could only be called 'curious' -- and that a charitable description. No doubt those who pursued this renovation in the 1980's were striving after the oft misunderstood principle of 'noble simplicity' but the irony here is that the historical chapel, with its orderly mural design, its central high altar and its chancel, was far more noble, simple and beautiful than its 1980's counterpart, which came off as cluttered and, frankly, dingy. It is worth commenting that the new sanctuary is designed in such a way that it could easily serve both forms of the Roman liturgy. What's more, there is ample space in the sanctuary even for the requirements of the Solemn Pontifical Mass in the usus antiquior -- which is an extraordinarily relevant consideration for a seminary institution today in the post Summorum Pontificum landscape. Most of these views may have been seen elsewhere already, but LAJ wanted to present a few closer details that you may not have seen elsewhere. 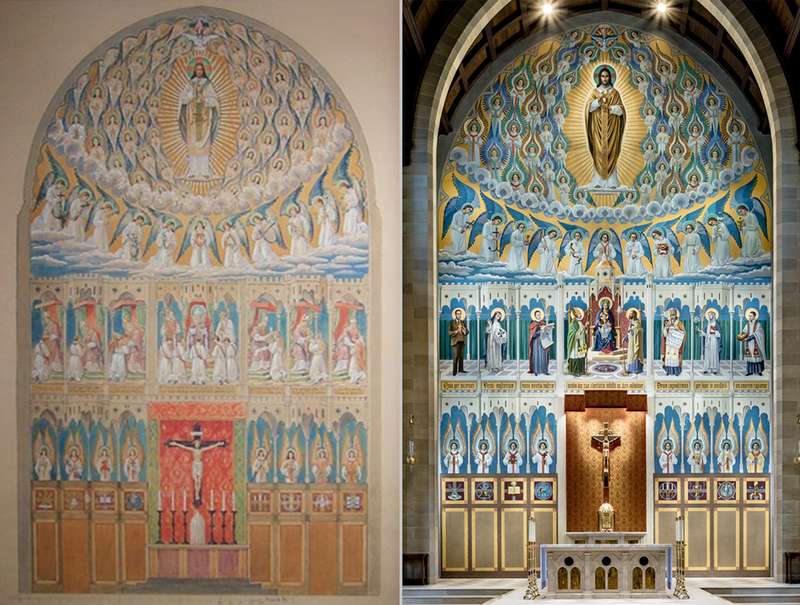 First off, here is a comparison of the former Lamers mural and the new mural which, while substantially the same, does have some differences. To the left is the original artistic rendering of the Lamers mural. It provides a good point of comparison since it is in colour. The main variances, of course, are found in the middle tier of the work but it is otherwise is substantially the same both in terms of its contents as well as its colours. 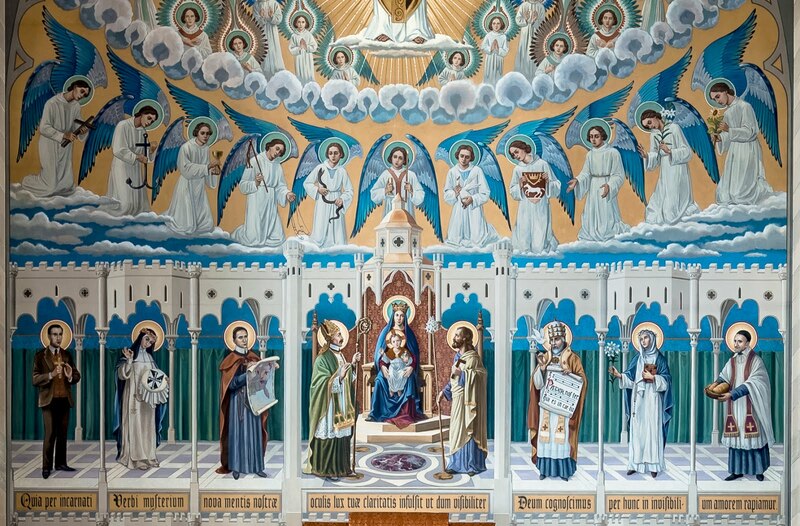 The colouring of this matches to the original Lamers mural and is quite breathtaking both in its symbolism and its artistic beauty. Beneath this is the middle tier of the mural which is where we see some new development compared to the historical mural. 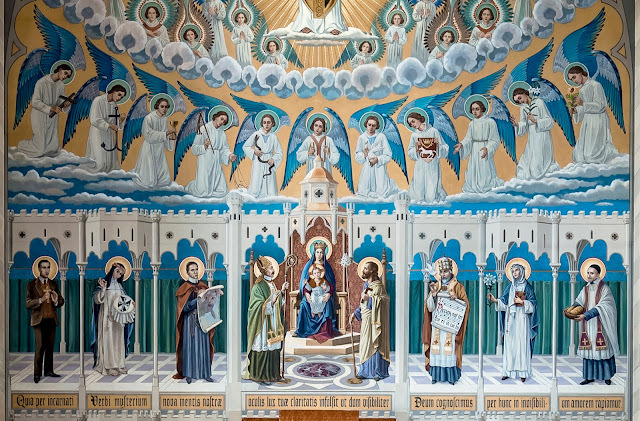 Formerly were depicted various traditional rites pertaining to priestly ordination from what can be seen of it in these photos. In the new mural we see various saints and the Latin text beneath: "Quia per incarnati Verbi mysterium nova mentis nostrae oculis lux tuae claritatis infulsit: ut, dum visibiliter Deum cognoscimus, per hunc in invisibilum amorem rapiamur." This text is found within the Preface of the Nativity and translates: "For through the Mystery of the Word made flesh, the new light of Thy glory hath shone upon the eyes of our mind, so that while we acknowledge God in visible form, we may through Him be drawn to the love of things invisible." 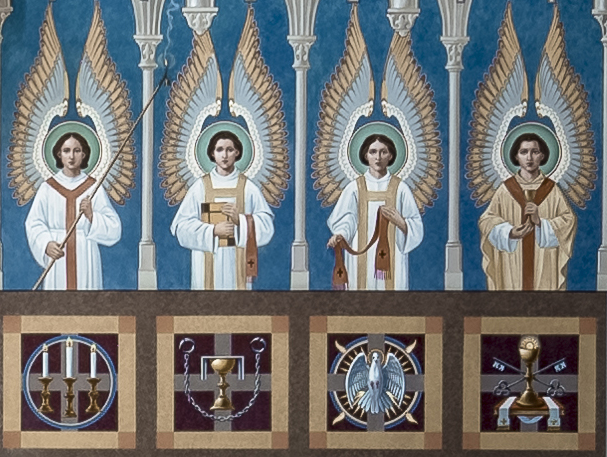 Above these figures are found more angels, holding various Christian symbols. We finally proceed down the level of the altar itself. 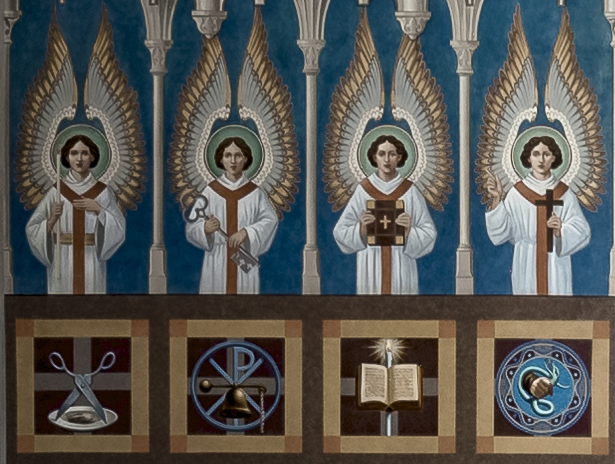 At the base the mural are depicted eight angelic figures with corresponding symbols found beneath each; these speak to the eight traditional stages of the journey of the seminarian through to the priesthood beginning with the tonsure, followed next by the four traditional minor orders (porter, lector, exorcist, and acolyte) and finally the three major orders (subdeacon, deacon and priest). A welcome nod to this venerable tradition. Turning to the altar itself, the new altar is proportionally closer to the original high altar and is certainly far better scaled to the chapel than its immediate predecessor -- not to mention more substantial and noble. The altar is also set upon a predella (the raised marble platform) which is an important and all too forgotten feature of many restorations and new church building today. 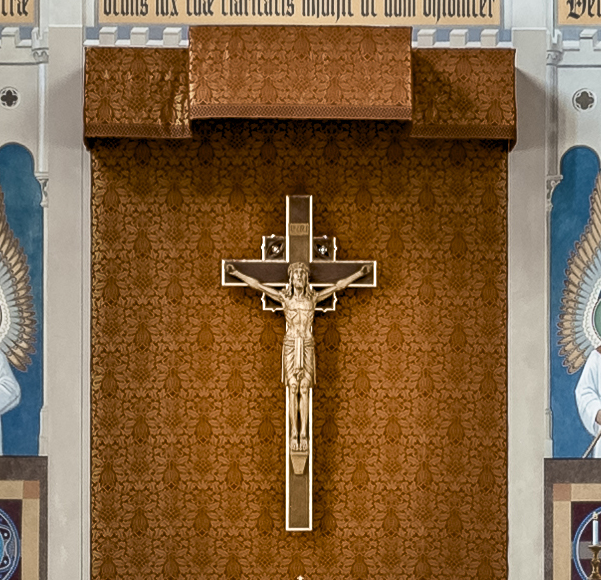 It is important not only practically, insofar as it provides servers a place to kneel for incensations, the ringing of the bells, or for the clergy to kneel for Benediction and so on, but it also helps to set the altar apart visually from the rest of the sanctuary, giving it hierarchical importance. The utilization of the dossal curtain here is also particularly appealing -- and an all too forgotten traditional ornament. 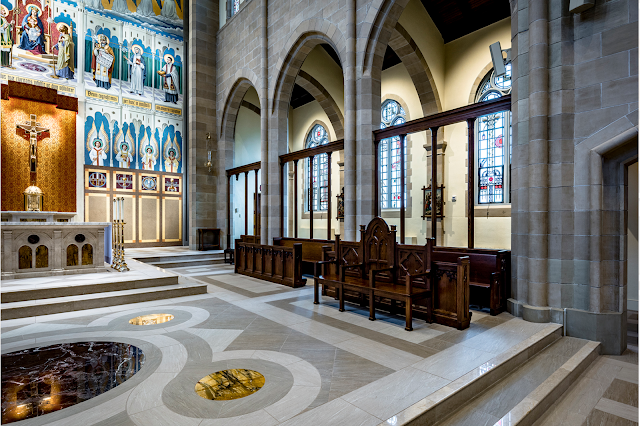 The floor of the sanctuary is also quite striking, utilizing a traditional quincunx pattern that features in so many cosmati pavements in the churches of Rome. 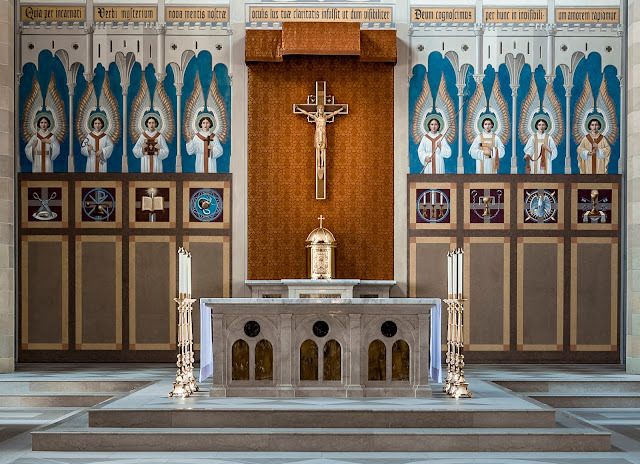 If there would be one proposal that I would make to the good folks at the PCJ it would be that they consider restoring the "Benedictine Arrangement" to their altar, placing candlesticks and cross upon it as they did formerly. 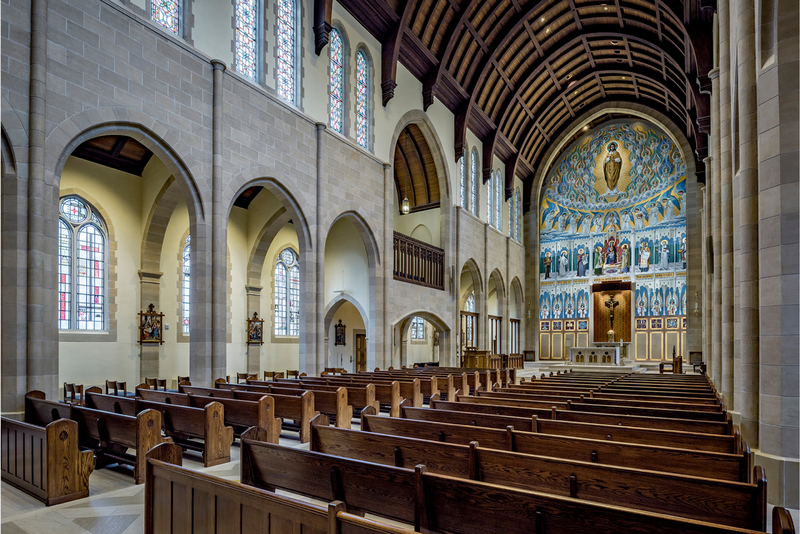 Pope Benedict XVI noted how very important this was to re-orienting the liturgy and there is no better time to begin learning this lesson than when you are a seminarian in the seminary, training for the priesthood. 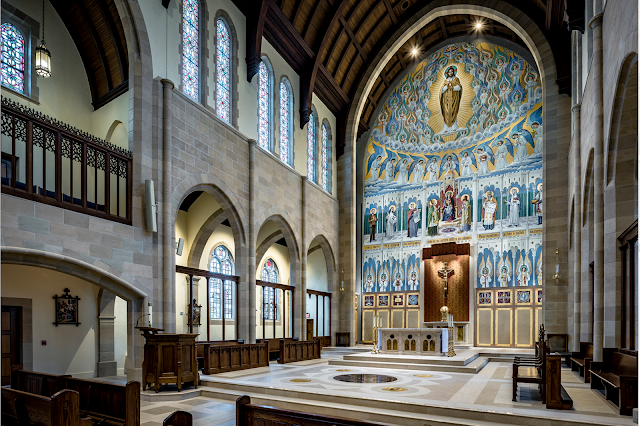 The Benedictine arrangement would not only provide the liturgical and theological benefits that Benedict XVI described for clergy and gathered faithful alike, artistically and aesthetically it would also further compliment and harmonize with the rest of the incredible restorative work they have undertaken here, lending an increased prominence and 'verticality' to the high altar -- which is so symbolically important given that it is the heart and centre of the church (or in this case, chapel). The entirely of this chapel has a vertical thrust to it, and adding six tall, traditional candlesticks upon the mensa would continue this narrative and draw one's attention immediately to the altar, particularly as they will further contrast nicely with the dossal curtain behind. 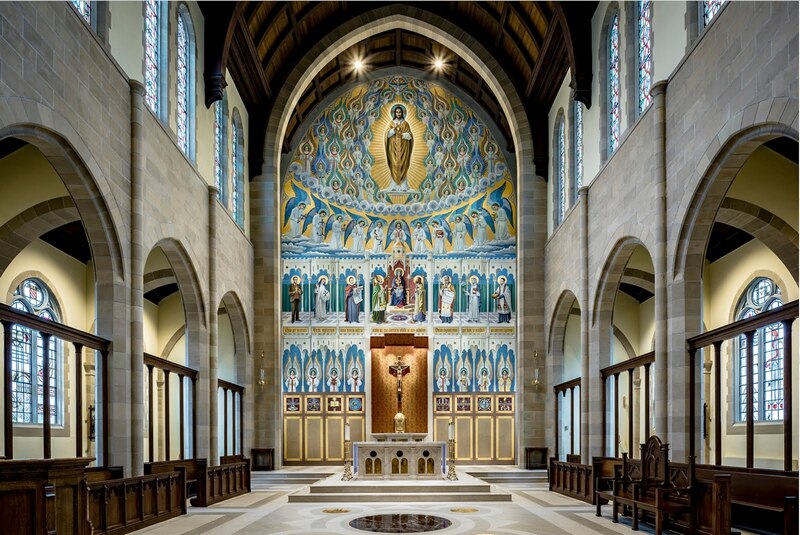 That small encouragement aside, LAJ wishes to extend congratulations to the Josephinum, William Heyer Architect, Evergreene Architectural Arts, and to all others involved in this magnificent restoration. 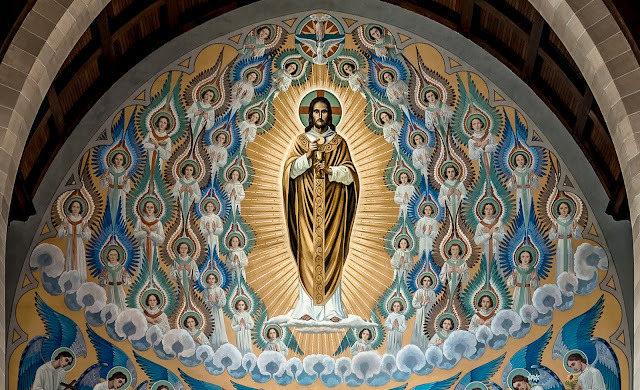 A truly astounding and ambitious work that will contribute both to the dignity of the sacred liturgy and to the spiritual edification of all who venture within its walls. May it be a model for others.